Pelican Landing Homes: OVER $100,000 MASSIVE PRICE REDUCTION!!!! .... BANK WANTS PROPERTY SOLD! ACCEPTING ALL REASONABLE OFFERS! GORGEOUS LARGE 5 BDRM, 4 FULL BATH RUTENBURG WITH IN-LAW SUITE. GOURMET GRANITE/STAINLESS KITCHEN, OPEN FLOOR PLAN, GAME ROOM, FIREPLACE, LIBRARY & OFFICE. LAKE VIEW W/LARGE PRIVATE LOT & MATURE FRUIT TREES. YOU WILL LOVE THIS HOUSE, GREAT VALUE!!!!! Hawthorne Homes: Beautiful home on private lot within the Hawthorne community. End lot with private lake view. This 4 bedroom 3 1/2 bath home has too many upgrades to list. Upgraded Kitchen and marble throughout. Beautiful Lakes for your walking pleasure. Clubhouse includes Fitness Room, 2 Pools, 2 Spas, Tennis Courts and endless community activities. In the Heart of Bonita Springs, close to Coconut Point, Publix, Fresh Market, Beaches, Miromar Outlets, Restaurants, Naples and Fort Myers. Superb! Bonita Farms Homes: Wonderful, pool home built in 2006 built on a double lot. Four bedroom, 3 bath home with approx. 2885 sq. ft. Air-conditioned living area and approx. 5488 sq. ft. total area. Bonita Pines Homes: PARADISE is HERE! AMAZING 3BR/3 BA Pool Home in beautiful Bonita Pines just South of Imperial River. Location, Location!!! West of Rt 41 and only a couple of miles from Bonita Beach! Oversized tiled Lanai and Pool area awaiting you and your guests for relaxing and entertaining! Interior has open and spacious Kitchen/Dining area, split bedrooms, large master bath with dual sinks and jetted tub. Don't delay-Schedule your showing TODAY of this gorgeous home! Bonita Golf Club Villas Bonita Golf Club Homes: 3 bedroom, 3 bath home located in Woodbridge Preserve of Bonita Golf Club Villas. Master suite and family room open up to the lanai. Large master walk-in closet. Master bathroom with separate shower and bath. Large kitchen pantry. Nice kitchen area with breakfast bar. 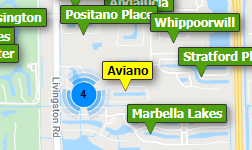 Winter Haven East Homes: Convenient Bonita Springs Location minutes to Downtown, I-75 and The Beach. This home features 3 Bedrooms, 2 Baths, Side Load Garage and No HOA Fees. Lakeside Hideaway Condos: For SALE TODAY! Come and enjoy this beautiful 2 bedrooms 2 bathroom condo. Fully equipped with tile and laminate flooring and a full kitchen. Impact glass hurricane windows and sliders! Immerse yourself in the resort lifestyle with the screen-in lanai/porch with the best lake and fountain view! Located just North of Downtown Bonita Springs and in near proximity to beaches, shopping, and restaurants, and the Interstate. Need professional assistance selling your property at Bonita Springs? Find out how an Area Specialist can help to generate more property exposure in order to get the most money for your investment in the least amount of time.